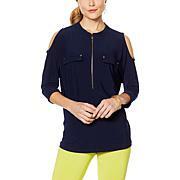 Nice, comfortable tunic. Love the added lace detail at the bottom. I purchased the black and iris. As soon as it warms up, I will enjoy enjoy wearing them! Thi Top is beautiful. I bought it because it was a solid color with crochet on the bottom and the back that had a nice flair. It fit my 1x frame perfect. At first I bought the black and purple, and went back and bought the blue and pink. Ka-bloom! Update your warm-weather wardrobe with an explosion of beautiful floral prints. 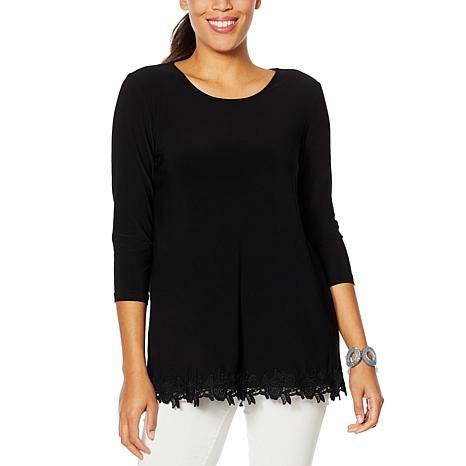 This must-have tunic features adjustable drawstrings at the shoulders, wispy chiffon fabric and a long tunic length for savvy, figure-flattering style.